Thai silk is famous throughout the world: rich, elegant and sumptuous. The journey of creating silk is intensive, with workers across the country dependent on the trade, but this story starts small before it gets to the changes weaving and textile production has brought to the country. 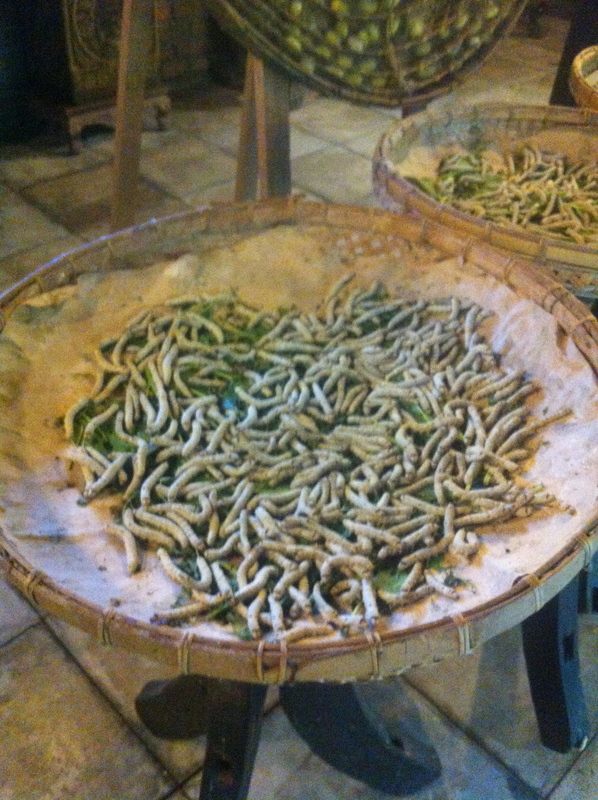 These are the silkworms, from whom silk is made. These are not the worms that produced the material pictured below, because they will have to die during the process: they will happily munch on mulberry leaves, spinning cocoons of silk and drifting into hibernation before being harvested and drowned. Poor worms. Not knowing this before visiting Bangkok, I went in search of more information at a royal gallery and a legendary silk house. The finished Thai silk is the product of those beautiful, golden threads on the loom, before it ends up as intricate dresses or tapestries. 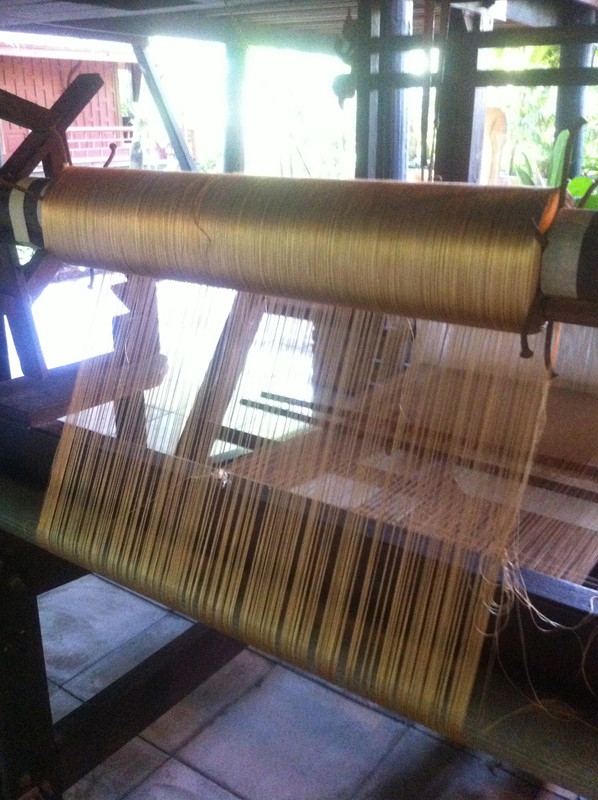 The loom, along with the worms, are at Jim Thompson House in Bangkok. In 1967 Jim Thompson, the American designer, entrepreneur and co-founder of the Thai Silk Company, disappeared in Malaysia’s Cameron Highlands. His body has never been found, and his presumed death is a mystery. 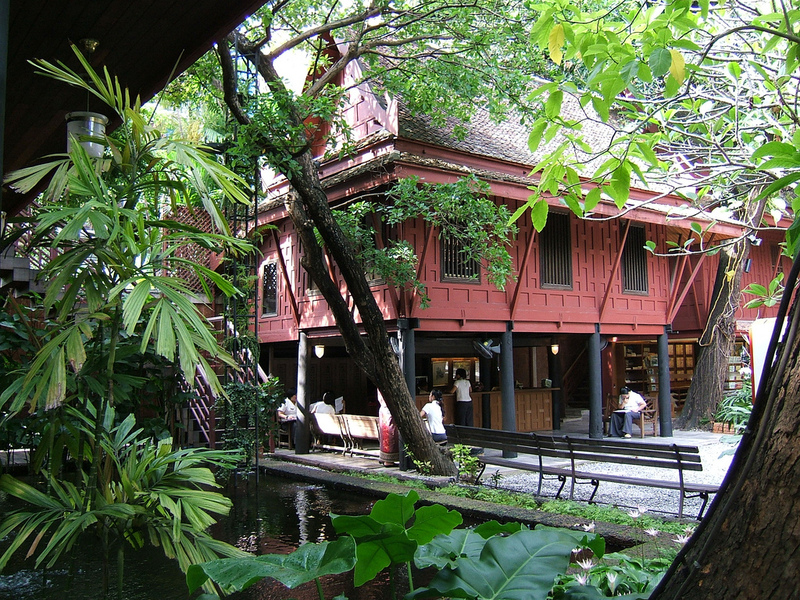 Many years later, with no sign of the man, his house in Bangkok and private art collections were opened to the public. The house itself is the main draw: a leafy paradise of fish ponds and polished wood. Jim Thompson is credited with the revival and development of Thailand’s silk industry in 1950s, presenting exotic exhibitions to America’s glitterati and founding a company that’s a 21st century luxury brand. 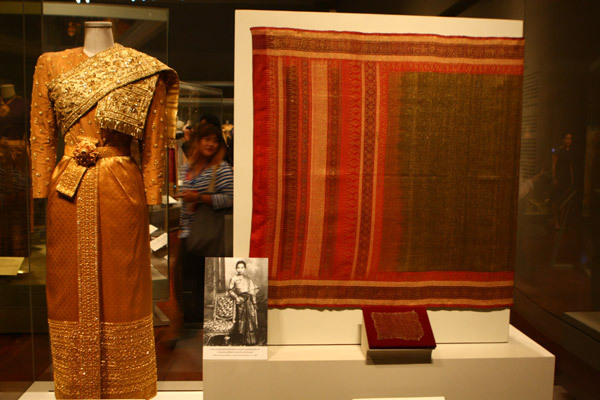 The Queen Sirikit Museum of Textiles, or พิพิธภัณฑ์ผ้าในสมเด็จพระนางเจ้าสิริกิติ์ พระบรมราชินีนาถ, builds on this global success of Thai silk, imbuing the industry with regal glamour. The Museum is one of those Royal displays that shows off the Queen’s frankly stunning back catalogue of official outfits, while glowing about the charitable projects she’s established. The monarchy is deeply respected by much of Thailand, with billboard of the royal family visible around the cities and Long Live the King posters of flower displays visible in local businesses. It’s a stylish contemporary exhibition, introducing the story of fashion, craft and the business of silk. The Queen has established a charitable enterprise to support the weaving of silk in regional areas of Thailand, where employment opportunities are scare. While the men are in the fields, the King surmised, the women must have a trade – and so the Queen championed the traditional role of women as weavers, setting up the SUPPORT Foundation. The Foundation intends to preserve and cultivate traditional arts, crafts and design, while working to supplement the income of rural families. They provide training, source materials and technologies and commission work for international markets. I’d have liked more detail on the challenges of setting up and sustaining emerging craft practises in rural Thailand: we get only brief glimpses of the women who do the weaving and, unlike the silkworms, there is no display that talks us through the stories of their lives. Next time I visit Bangkok, I’d like to meet some of these ladies, and find out more about the impact of these smaller enterprises in the Thai textile industry.